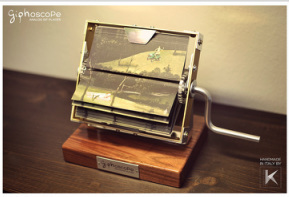 Marco Calabrese & Alessandro Scali have created the Giphoscope. 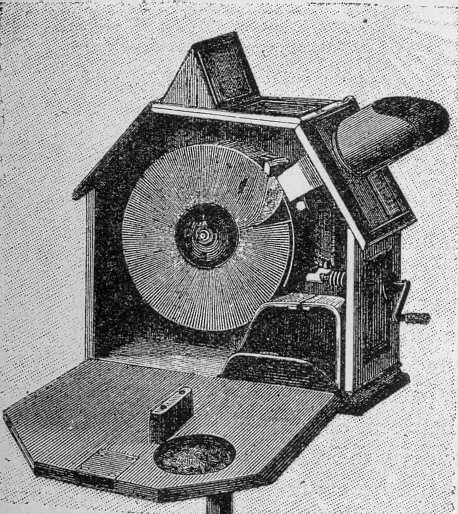 I've been looking at developing a new take on the mutoscope, a machine created in the 1890s often known as a 'What the Butlers Saw' machine. Using a series of film frames printed on paper and mounted on a reel, mutoscopes work just like a flick book, only there is scope for more frames and a more stable flick speed. I want a mechanism that can be installed so that my sequence is framed by the landscape through which it travels. 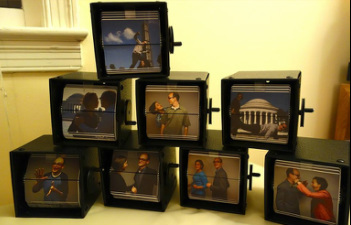 Flipbookit has created a mutoscope kit and software to enable people to make mutoscopes from film clips or photo sequences. These are moving portraits using flipbookit kits made by a couple for their wedding. Artist Juan Fontanive has made beautiful sculptural animations.